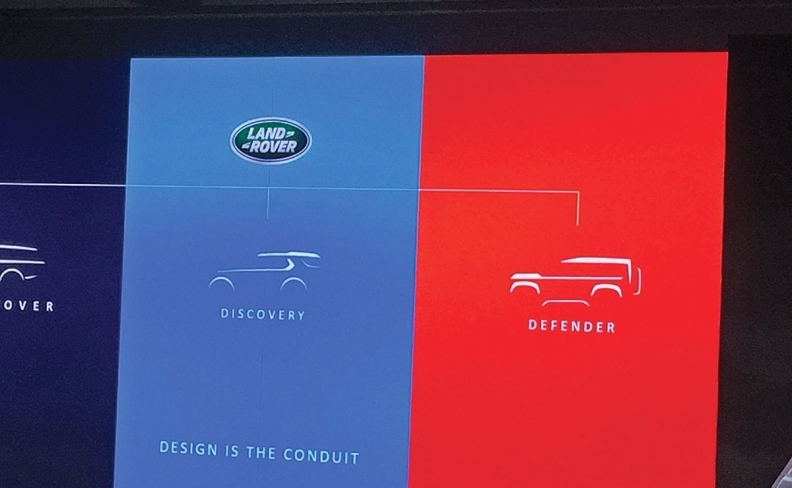 A Jaguar Land Rover slide suggests the next Land Rover Defender won't lose its iconic shape. Jaguar Land Rover is under increasing pressure to reveal more about the redesigned Land Rover Defender, coming late next year. During the opening of JLR's new U.S. headquarters last month in Mahwah, New Jersey, the company peeled the curtain back a little on the iconic off-road vehicle. A slide showing three families of Land Rover vehicles gave the closest indication yet that the next Defender will retain its traditional boxy, rugged looks. Meanwhile, on the sidelines of the New York auto show, Joe Eberhardt, JLR's U.S. boss, came close to confirming the Defender will be coming to the U.S.
"We've said it's a global vehicle," he said. "The United States is on the globe."